The Jump Rope Training For Weight Loss And Toning With Buddy Lee video is becoming one of the most sought-after jump rope workouts. 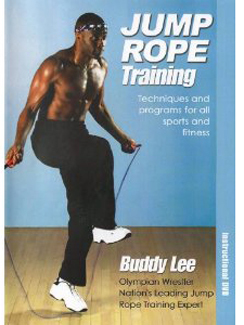 If you are searching for a low-impact cardio workout you can do at home, Buddy Lee's jump rope dvd may be what you are looking for. Obviously, you will only get out of it, what you put into it, but his video has skills and jump rope routines for all fitness levels...beginner to advanced. You can dial up your jump rope workouts as your skill increases and your fitness improves. * This DVD runs 30 minutes. * Buddy teaches you four steps to mastering the jump rope for weight loss and fitness. * This jump rope workout is meant to be a 5-10 minute supplement to your overall home workout program. * You'll learn the correct way to progressively build endurance to maximize weight loss and increase your fitness level. * You will learn different jump rope techniques that build on each other as your skill develops. * Remember, jumping rope for weight loss must include making good food choices and following a solid nutritional plan. A 10-minute jump rope workout will NOT overcome a diet that sabotages your fat loss efforts.